Rita Wirtz is a reading specialist with 40 years’ experience in K-12 classrooms, clinics, and labs. 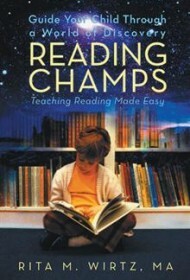 Reading Champs is intended to supplement school curricula and reading programs and can be used by both professional and nonprofessional “coaches”: teachers, assistants, parents, or tutors. The well-organized book presents 49 units, called Common Sense Mini Lessons (CSML) by Wirtz. The skills taught align with the California reading guidelines and are compatible with other state and federal guidelines. Each CSML is based on a directed activity to learn or review a skill, including sounding out words, comprehension, and sequencing. Wirtz offers coaches information on learning prerequisites and hints to help learners master skills. Lessons follow a consistent structure of “Introduction”; “Why Do We Need to Know This?”; “Learning Activities,” and “Summary” and are presented in developmental order, building upon previous lessons. Wirtz has carefully conceived the activities, which can be easily taught with household print materials, storybooks, and charts printed in the book. As an example, the learning activity for compound words involves dividing each of the two words in a list of compounds. The helpful hint differentiates between compound and hyphenated constructions, and the chart provides a visual tool showing how two words are combined to make a new word with a new meaning. The book contains 48 instructional or informational charts, including a lesson template. (Although Wirtz offers a link to her website where the charts can purportedly be downloaded as full-size, full-color, reproducible copies, this link wasn’t working during a spot check, a major disappointment.) Wirtz also includes lists of resources and links to many California common core reading websites. Reading Champs is a comprehensive, easy-to-follow guide for supporting teachers in classroom instruction. And parents will find it especially useful in helping them understand what skills should be mastered before teaching each new task. In sum, it’s a valuable resource for anyone tasked with helping students improve their reading skills.